Several weeks ago I made a conscientious decision. That decision was to focus on one goal and one goal only. I’ll admit it’s a strange goal, and it’s difficult to put into simple words or explain in a way that many people will understand, but for long time readers of this blog, that shouldn’t come as a surprise ;). In August, I’m going to be presenting a talk with Harrison Lovell about Coyote Teaching, and the ways in which this type of teaching can help inform us better than rote example and imitation. As part of this process, I thought it would be fun to take something that I do that is completely outside the realm of software testing, and see what would happen if I applied or examined Coyote Teaching ideas and techniques in that space. Personally, I found the results very interesting, and over the next few days, I’m going to share some of what I learned, and how those lessons can be applied. What was this unusual project? It’s all about “playing pirate” ;). One of the things I’ve been famous for, over several Halloweens, has been my elaborate and very involved pirate costumes. Why pirates? They fascinate me, always have. They are the outsiders, the ones who dared to subvert a system that was tyrannical, and to make a world that was built on their own terms. Granted, that world was often bloody, violent, deceptive, and very dangerous, with a strong likelihood the pirates would be killed outright or publicly executed, yet it has captured the imaginations of generations through several centuries. Here in Northern California, there is an annual affair called the Northern California Pirate Festival. 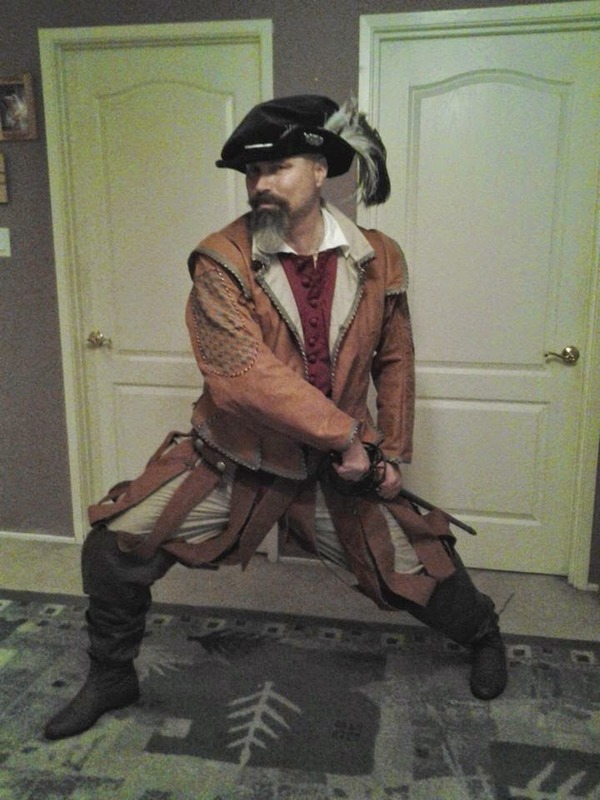 Many people dress up and “play pirate” at this event, and last year I made a commitment that I would be one of them. More to the point, I decided I wanted to go beyond just “playing pirate”, I wanted to get in on the action. Now, in this day and age, get in on the action doesn’t mean “become an actual pirate”, it means join the ranks of the re-enactors. This year was a small step, in that I chose to volunteer for the festival, and work in whatever capacity they needed. With this decision, I also opted to go beyond the Halloween tropes of pirates, and actually research and bring to life a composite character from that time, and to pay special attention to the clothes, the mannerisms, and the details of the particular era. Most people when they look at popular representation of pirates, they’re looking at tropes that represent the Golden Age of Piracy, that period in the early 1700s where many of the famous stories are set (The Pirates of the Caribbean franchise, Treasure Island, Black Sails, etc.). What this ignores is the fact that piracy had been around for millennia, and there were other eras that had a rich history, and an interesting look, all their own. To this end, I decided that I wanted to represent an Elizabethan Sea Dog. My goal was to have people walk up to me, and say “hey, you look different than most of the people here”, and then I could discuss earlier ages of piracy, or in my case, privateering (and really, if you were on the side of the people being attacked, that difference was mostly irrelevant). To make this a little more interesting, I decided to make my outfit from scratch. The only items I did not make from scratch were my boots, my hat, and the sword and dagger that I chose to carry. Everything else would be hand made, and here is where our story really begins. The first order of business if you choose to be a re-enactor, is to do research. If your character is a real person, you need to know as much as possible about not just their personal histories, but about their time period, where they came from, the mores of the day, the situations that may have driven someone to be on the high seas in the first place, and those decisions that might potentially lead them to being privateers or pirates. Even if the character you are reenacting is fictitious, you still want to be able to capture these details. I spent several months reading up and examining all of these aspects, but I gave the clothes of the era special attention. What did a mariner in the mid-1500s actually wear? To this end, I came up with a mental picture of of what I wanted my Sea Dog to look like. 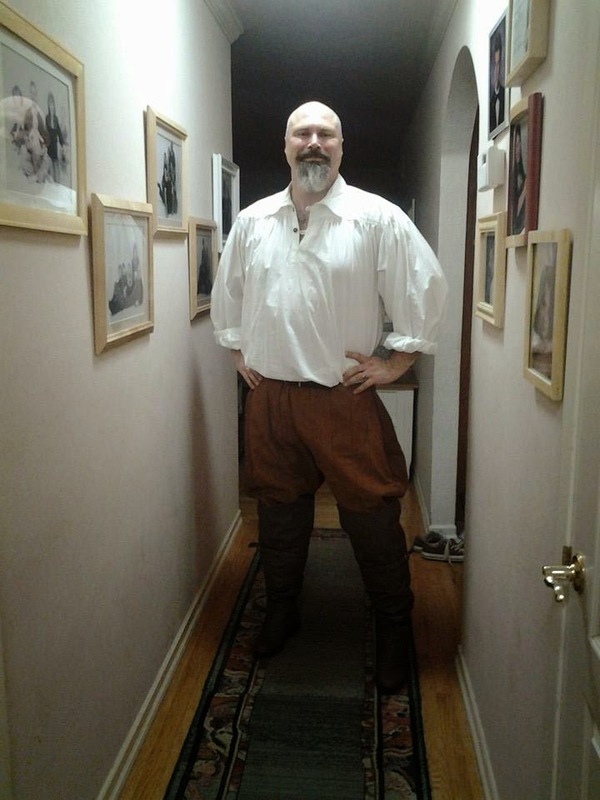 My Sea Dog would have high Calvary style boots, long pumpkin breeches, a billowy Renaissance style shirt, a close-fitting jacket (referred to as a “doublet”), a thicker outer jacket, called a jerkin, and would wear what was called a “Tudor Cap”. I would also make a wide belt capable of carrying both a rapier and a main gauche (a parrying dagger used in two handed dueling, common for the time period). I would make the “frogs”, or the carriers for the sword and dagger. I’d also make a simple pouch to hold valuables. Just a handful of items. It didn’t seem that complicated. As one who already knew how to sew, and has had experience making clothes in the past, I figured this was a project I could knock out in a weekend. Wow, was I ever wrong! I thank you if you have stuck with me up to this point, and you may be forgiven if you are thinking “wow, that’s quite a buildup, but what does this have to do with the Coyote Teaching method?” Well, let’s have a look, starting with the first part of the project, the pumpkin breeches. Through my research I decided I wanted to create something that look dashing, and a little dangerous, and I decided that I would use leather and suede in many of the pieces. The problem with using leather and suede is that it doesn’t come on a regular sized bolt of fabric. In fact, real leather and suede is some of the most irregular material you can work with, since it entirely depends on the particular hide you are examining. I quickly realized that I had no pieces that would give me a size to cut a full leg portion from any of my pattern pieces. What to do? In this case, I decided to piece long strips of three inch wide suede together. This would give the look of “panel seams”, and give the sectional look that is common for pumpkin breeches. So let’s think about the easy part. Make a pair of pants. Just cut some material, and stitch it together, right? – lay out the remaining pieces and utilize a template to cut the strips needed. Repeat 40 times. – take regular breaks because cutting through suede is tiring. Irregular suede pieces cut to a uniform width and length. – baste the pieces together and stitch them down the length of the strips, so as to make panels that were ten strips wide. – make four of these panels. – size the pattern for the dimensions of the pants desired. 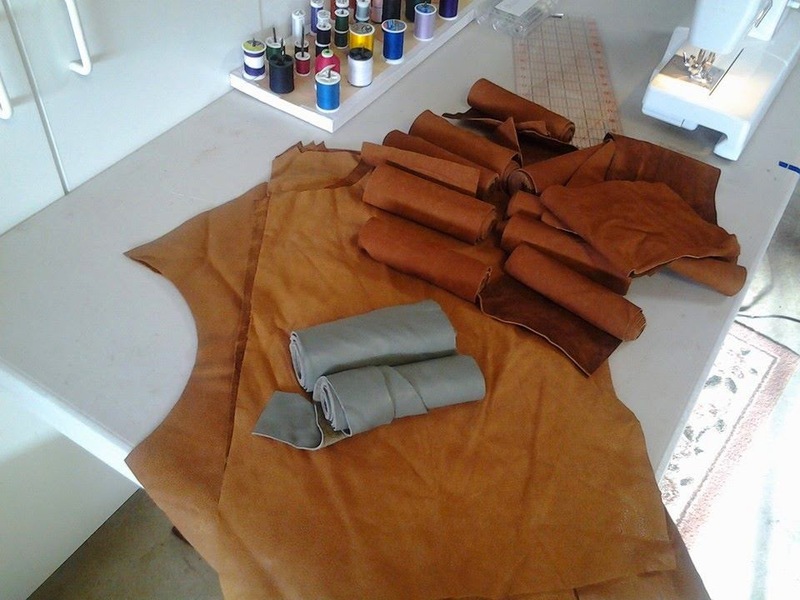 – cut matching pattern pieces out of linen to act as a lining for the suede. – pin and piece together the lining and outer suede and sew them together. – replace broken needles, since suede is murder on sewing machine needles, even when using leather needles. – unstitch areas that bunched up, or where the thread was visible and not cleanly pulled, or where thread broke while stitching. – make a cutaway and stitch a fly so that the pants can be opened and closed (so as to aid putting on and taking off, and of course, answering the call of nature). – punch holes to place grommets in the waistband (since breeches of this period were tied to the doublet). That weekend I had set aside to do the whole project, actually gave me enough time to size the suede and cut the strips I would need. That’s all I managed to do in that time, because I discovered a variety of contingent steps needed. I had to get my tools together, determine which of my tools were up to the task, which tools I didn’t even own, and clear space and set up my work area to be effective. These issues took way more time than I anticipated. How long did it take me to actually make these breeches? When all was said and done, a week. Using whatever time I could carve out, I estimated I spent close to 14 hours getting everything squared away to make these. I liked how they turned out, I thought they looked amazing… that is, until I gave them a test run outside in the heat of the day, and realized that I would probably die of heat exhaustion. Since the weekend of the event was looking to be very hot (mid 90s, historically speaking, with one year reaching 104 degrees) I realized these pants would be so uncomfortable as to be unbearable. What could I do now? I had put so much time into these, I didn’t have time to start over. Fortunately, research to the rescue. It turns out that there was a style of pumpkin breeches that, instead of being stitched together, had strips of material that acted as guardes, and that hung loosely rather than stitched together. After looking at a few examples, and seeing how they were made, I decided to cut open all of the seams I had spent so much time putting together, and reinforcing the sections at the waist and at the bottom of the leg. It was a long and tedious change, but it allowed air to escape, and me to not die of heat exhaustion. open air version of the pumpkin breeches. This whole process brought into stark relief the idea of estimating our efforts, and how we, even when we are experienced, can be greatly misled by our enthusiasm for a project. Was I completely off base to think I could get this project done in a weekend? Turns out, yes! It may have been correct or accurate if I were to be using standard bolt fabric, but I wasn’t. I chose to do something novel, and that “novel” approach took five times longer to complete. What’s more, I had to actually undo much of the work that I did to actually make it viable. My estimate was dead wrong, even though I had experience making pants and making items to wear. I knew how to sew, I knew how to piece together items, I’ve actually made items, so I felt that gave me a good confidence to make an estimate that would be accurate. I’ve come to appreciate that, when I try to make an estimate on something I think I know how to do, I am far more likely to underestimate the time requirements needed when I am enthusiastic about the project. In contrast, if I am pessimistic about a project, I am likely to overestimate how long it will take. Our own internal biases, whether they be the “rose colored glasses” of optimism, or the depletion of energy that comes with pessimism, both prevent us from making a real and effective estimate. Knowing what I know now, how would I consider guiding someone else to do a similar project? I could tell them all of the pitfalls I faced, but those might not be helpful, unless they are doing exactly the same thing I am doing. Most of the time, we are not all doing the exact same thing, and my suggestions may prove to be a hindrance. 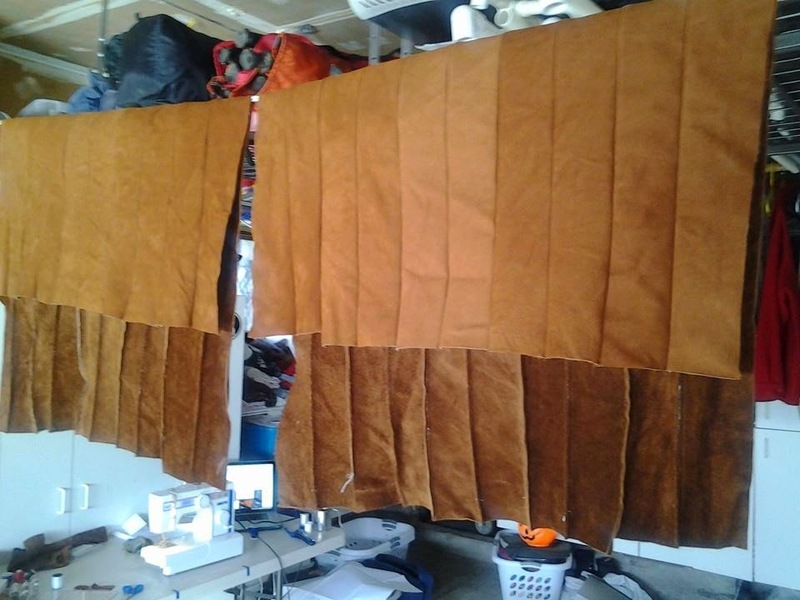 Knowing now what I know about the process of preparing suede in sections, I would likely walk the person through defining what might be done. In the process, it’s possible they might come up with answers I didn’t (“why are we using real suede, when we can buy suede-cloth that is regular sized on a bolt?”. “Couldn’t we just attach the strips to a ready made pair of pants?”). By giving them the realities of issues they might face, or allowing them to think through them on their own, we can help foster avenues and solutions that they would not find on their own, or that perhaps we wouldn’t, either. One thing is decided, though… the next outfit I make (and yes, be assured, I will make another one 😉 ) is going to be made with regular bolts of wool, cotton or linen, rakish good looks be darned.